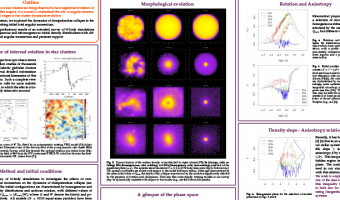 We investigate the dynamical evolution of a star cluster in an external tidal field by using N-body simulations, with focus on the effects of the presence or absence of neutron star natal velocity kicks. 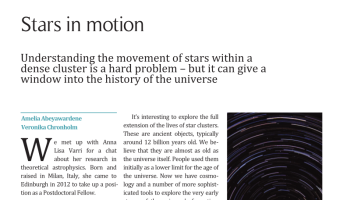 We show that, even if neutron stars typically represent less than 2 per cent of the total bound mass of a star cluster, their primordial kinematic properties may affect the lifetime of the system by up to almost a factor of 4. 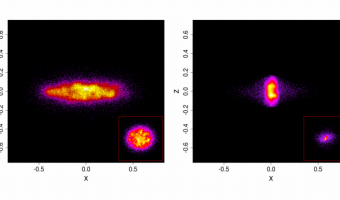 We interpret this result in the light of two known modes of star cluster dissolution, dominated by either early stellar evolution mass-loss or two-body relaxation. The competition between these effects shapes the mass-loss profile of star clusters, which may either dissolve abruptly (`jumping’), in the pre-core-collapse phase, or gradually (`skiing’), after having reached core collapse. For details, have a look at the MNRAS Letter. 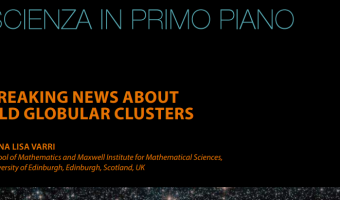 This project has been conducted by Filippo Contenta, a PhD student at University of Surrey, who, during the 2014 ISIMA program, has worked under the supervision of Douglas Heggie and myself. Time evolution of the fraction of bound mass for models with initial concentration W0 = 5, on circular orbits. These are characterized by different number of particles (for each colour, right to left: 128k, 64k, 32k, 16k and 8k) and by the presence (red lines) or the absence (blue lines) of NS kicks. The corresponding models studied by Baumgardt & Makino (2003), i.e. without NS kicks, are also shown (green dashed lines). The black dots mark when core collapse occurs. 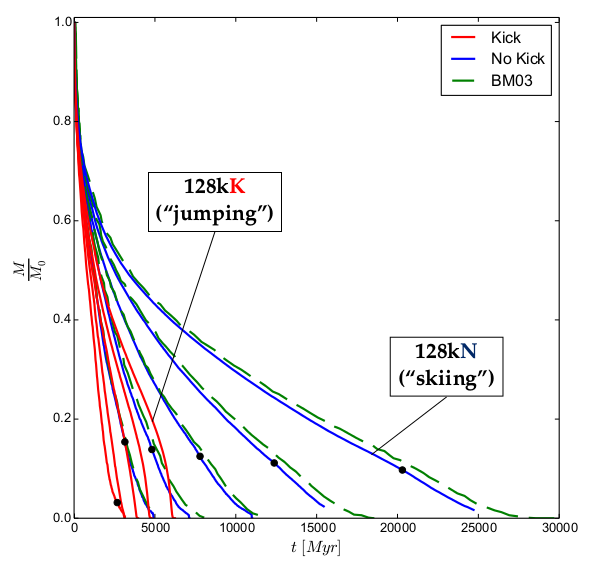 Models with kicks end their evolution by losing mass precipitately (“jumping”, except for the case N = 8k), whereas the others lose mass at a more moderate rate (“skiing”) and reach core collapse.